Why Does a Duck Float? Ducks may make floating along on a pond's surface look easy, and with good reason. For a duck, staying afloat on the water is practically as easy as hunkering down on dry land, and it's all because of a few key biological adaptations. Without these adaptations, floating wouldn't be any easier for a duck than it is for a human. All ducks have what's called a uropygial gland, or an oil gland, near the base of the tail. This gland secretes a special oily substance that the duck spreads over his entire body using his beak. The oil coats his feathers, making them water-resistant. Without it the feathers would absorb water, making them significantly heavier—it would be like you swimming with your clothes on. This water resistance also allows ducks to stay warm in frigid waters, as the feathers repel cold water and keep it away from the skin. Ducks' feathers help them float not just by repelling water, but by trapping air. Their feathers have tiny barbs, which allow them to latch together like Velcro. This creates a balloon-like effect, trapping air between the feathers and the skin, and those air bubbles add to the duck's natural buoyancy. 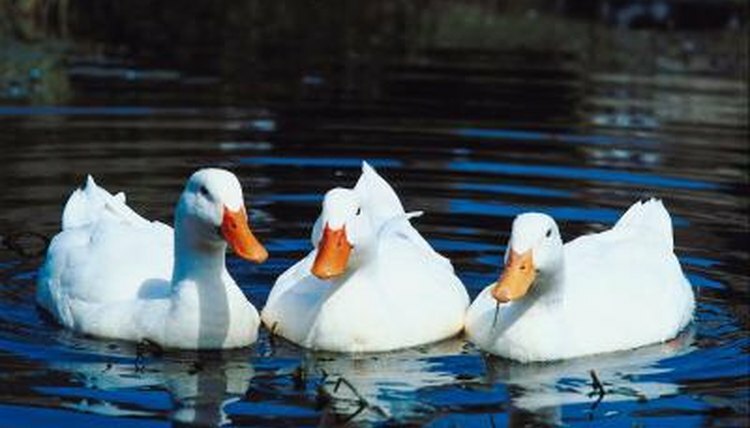 Ducks can release trapped air bubbles at will, which allows them to invert their bodies and submerge their heads while still bobbing at the surface. Like most other birds, ducks have hollow bones that enable them to fly. If their bones were as dense as a human's, they would be too heavy for flight. Their light weight also enables ducks to float more easily, but not at the expense of strength. This is because their bones aren't hollow like a drinking straw, but are rather filled with crosshatched, woven bone material that gives them stability without adding much weight. When you hold your breath, your body floats more easily, because the trapped air gives it buoyancy. Ducks are able to float for long periods because of this same principle, but without holding their breath. This is because their bodies are equipped with internal air sacs that store air like balloons, making them extremely buoyant without affecting their ability to breathe. Why Do Whales Have Two Blow Holes?